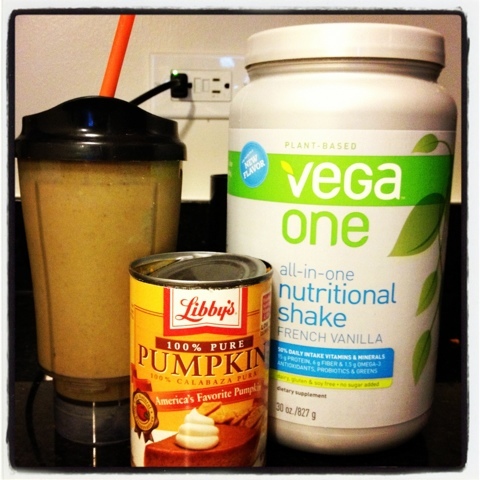 I recently purchased the new Vega One French Vanilla flavor and it is so good that I've been experimenting more with the ingredients in my morning smoothies. I first posted about the basic protein smoothie that I make every morning, especially after working out. It wakes me up better than coffee because it is loaded with vitamins and other nutrients. So it's October and of course pumpkin is everywhere! From jack-o-lanterns to pumpkin spice lattes, October is definitely the month of pumpkin. Pumpkin sometimes get a bad rep because it is usually served in sweet, unhealthy things like pumpkin pie. However, this squash is really healthy on its own. It contains fiber and lots of minerals and vitamins. It is especially high in beta-carotene (vitamin A) which is the same thing that makes carrots orange. I made some healthy pumpkin pudding last week and actually ate it before my great run on Friday and had tons of energy. I'll share that recipe with you later. For now, think about adding some pumpkin puree to your smoothie. Make sure is 100% pure pumpkin and not pumpkin pie mix (which has sugar and other things). Mix together in a blender and enjoy! I use my handy-dandy Hamilton Beach Personal Blender which turns into a to-go cup. You can add more or less of the pumpkin and spices according to taste. Birchbox - sample beauty products!